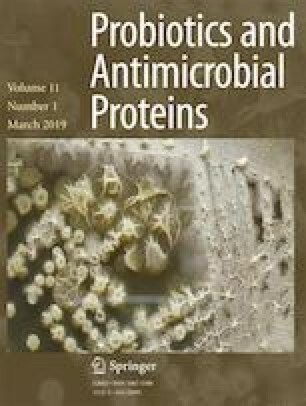 The study aims to evaluate the cell-free supernatant (CFS) from Lactobacillus plantarum strain MYS44 against the growth and aflatoxin production by Aspergillus parasiticus MTCC 411. Standard in vitro techniques revealed the potential antifungal activity of CFS of LpMYS44. In poison food technique, it was observed that 6% CFS of LpMYS44 retarded maximum growth. The inhibition of A. parasiticus on peanuts confirmed the ability of CFS of LpMYS44 for biopreservation. Further, CFS of LpMYS44 was purified by chromatography and analyzed by GC-MS. The major antifungal compounds were oleic acid, octanoic acid, butanamide, and decanoic acid derivatives. Twofold concentrated 80 μL of CFS was found to be minimum inhibitory concentration (MIC) of CFS of LpMYS44. CFS of LpMYS44 suppressed the germination and growth of the spores of A. parasiticus. Microscopic observation showed that CFS of LpMYS44 severely affected the hyphal wall of A. parasiticus by the leakage of cytoplasmic content leading to complete destruction. Acidic condition is favorable for CFS of LpMYS44 activity. In poultry feed sample, CFS of LpMYS44 reduced the aflatoxin B1 content by 34.2%, reflecting its potentiality to use as detoxification agent. The multiple antifungal components in CFS of LpMYS44 exhibited antifungal properties against aflatoxigenic A. parasiticus resulted in causing overall morphological changes. Furthermore, we also observed the biopreservative ability of CFS of LpMYS44 against A. parasiticus and AFB1 reduction in for poultry feed. This study makes a contribution to using CFS of LpMYS44 and their applications in food and feed as pretreatment against aflatoxigenic A. parasiticus to reduce or eliminate AFB1 and maybe other aflatoxins, produced by other Aspergillus spp. We thank the Central Instrumentation Facility, Institute of Excellence (IOE), University of Mysore for providing timely assistance for fluorescent microscopy. We also thank the SERB (Science and Engineering Research Board), India (No. EEQ/2016/000273; dated 23/02/2017) for their valuable support.